Step inside the Alphabet Forest and discover alphabet activities for all ages. Take pictures with Fair Letters, create alphabet Ferris wheels, add your fair words to the Fair Dictionary and more! Guests can meet a different author each day in the Alphabet Forest at the Blue Ribbon Homegrown Author Showcase. 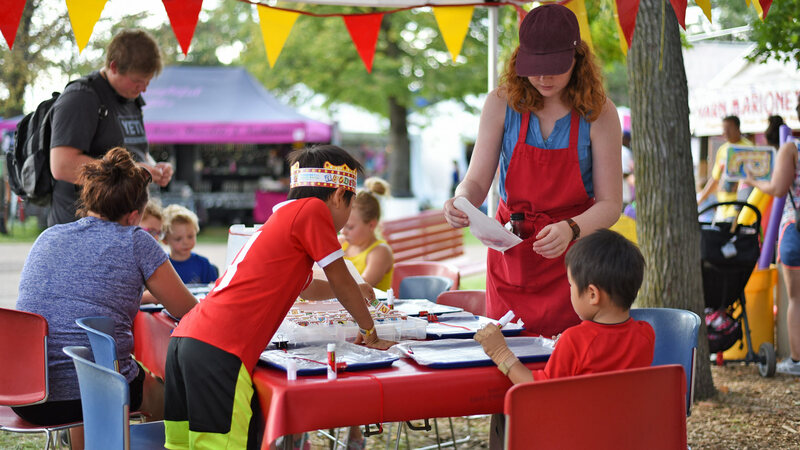 Activities are brought to you by the Minnesota State Fair Foundation, MELSA Metro Public Libraries, Red Wagon Books, Winding Oak, Northwood Industries and Debra Frasier. During your visit to the fair, play the Fabulous Fair Alphabet Game. Print a Fabulous Fair Alphabet game card or pick one up from any State Fair Information Booth. Look for words in what you SEE, HEAR, READ, FEEL - and certainly in what you EAT - at the fair! Write these words on the card, recording two words for each letter of the alphabet. (For example: Write a word that begins with “A” beside the printed A. Remember that X’s are rare - simply look for words that contain an X.) Bring your completed card to the Alphabet Forest at Baldwin Park and win a blue ribbon!